With the Trump euphoria pushing the broader markets to new all-time highs, it has impacted precious metals demand considerably… especially in February. Precious metals investors believing the White House “Grandiose plans”, of making American great again, have cut back seriously on their precious metals buying. There seems to be a percentage of the alternative community that are convinced that Trump will actually put the U.S. back to the way it was in the 1960’s. And that is, back to a manufacturing powerhouse with high-paying jobs. While this would be a wonderful thing to do, the continued disintegration of the global oil industry, just won’t allow it to happen. 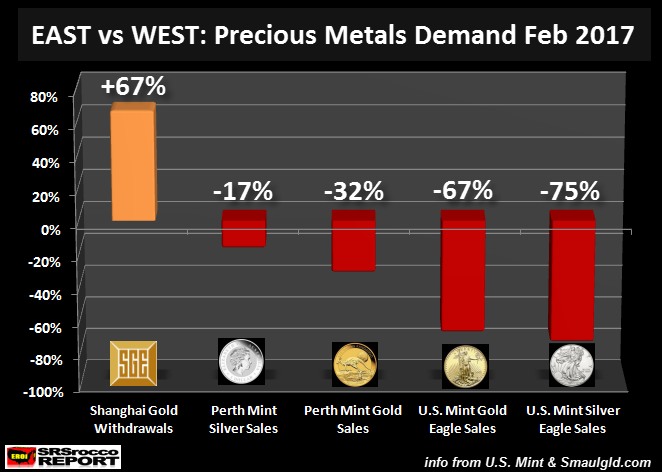 Regardless, Western demand for precious metals declined considerably in February versus the same month last year. A few years ago I spent more time publishing articles on gold and silver demand, but have refocused my analysis on how energy will impact the precious metals, mining and the overall economy. Withdrawals surged 67% in February versus the same month last year, while Perth Mint silver sales declined 17%, Perth Mint Gold sales dropped 32%, U.S. Gold Eagles fell 67% (American Gold Eagle price) and Silver Eagle sales plummeted 75%. Chinese Shanghai Gold Exchange withdrawals were 179 metric tons (mt) in February compared 107 the same month last year. Gold withdrawals from the Shanghai Gold Exchange are a pretty good proxy for the physical metal demand taking place in China. We must remember, global monthly gold mine supply is approximately 265 mt. Which means, the Shanghai Gold Exchange withdrawals of 179 mt accounted for two-thirds of global gold monthly mine supply. That’s a heck of a lot of demand… from just one country. The decline in U.S. Gold Eagle and Perth Mint gold coin sales in February versus last year equaled 67,806 oz. 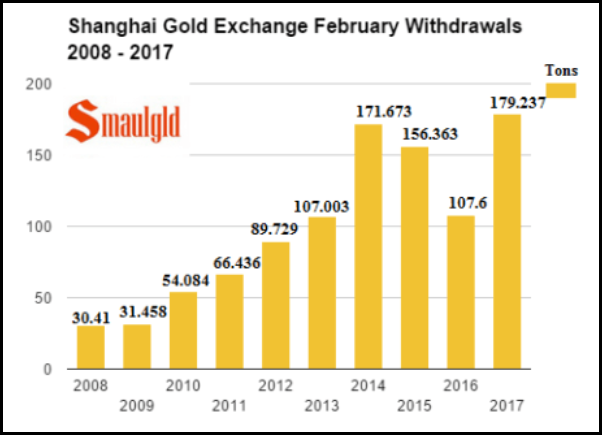 However, Shanghai Gold Exchange withdrawals increased 2,315,000 oz in February compared to the same month last year. So, we can clearly see that the increase in just Chinese demand, via the Shanghai Gold Exchange withdrawals, more than made up for the decline in Western retail official cold coin purchases. Unfortunately, the Royal Canadian Mint does not publish their Gold or Canadian Maple Leaf Silver sales until after the end of each quarter. That being said, Canadian Gold and Silver Maple Leaf sales normally parallel what is taking place in U.S. Eagle sales. Thus, Gold & Silver Maple Leaf sales are probably down signifcantly as well. I would imagine most precious metals investors came across this article published on Zerohedge a few days ago, Demand For Physical Gold Is Collapsing. It seems as if the intent of this article was to generate a lot of READS. Because, if we look at what is taking place in China, there is no collapse in physical gold buying. Matter-a-fact, there was a record amount of gold withdrawn off the Shanghai Gold Exchange last month. Western physical precious metal demand (especially in the USA) decreased significantly due to the Trump Market Euphoria, while Shanghai Gold Exchange withdrawals hit a new record in February as the Chinese realize the U.S. economy and Dollar is still toast. I am completely dumbfounded by recent decline in precious metals demand and sentiment in the West. While I can understand the reason precious metals investors believe Trump will make America great again, the awful ENERGY DYNAMICS in the future will not allow us to return to the good ‘ole days of a manufacturing super-power. Rather, the upcoming collapse will change our lives forever. When the Dow Jones Index and broader markets finally crack, there won’t be many SAFE HAVENS to invest in. Along with a collapse of the Dow Jones Index, Real Estate prices in all sectors will also head down the toilet. Investors scrambling for something to protect wealth will finally move into precious metals. Unfortunately, there won’t be the available supply… only at MUCH HIGHER PRICES. So, this current downturn in Western physical gold and silver purchases do not faze me one bit. It only indicates that most Americans are completely insane when it comes to sound fundamental investing.